1. Department of Anatomy, Physiology, and Pharmacology, College of Veterinary Medicine, Auburn University, Auburn, Alabama 36849-5519, USA. 2. Key Laboratory of Freshwater Animal Breeding, Ministry of Agriculture, College of Fisheries, Huazhong Agricultural University, Hubei Collaborative Innovation Center for Freshwater Aquaculture, Wuhan, Hubei 430070, China. The melanocortin-4 receptor (MC4R) is a Family A G protein-coupled receptor that plays an essential role in regulating energy homeostasis, including both energy intake and expenditure. Mutations leading to a reduced MC4R function confer a major gene effect for obesity. More than 170 distinct mutations have been identified in humans. In addition to the conventional Gs-stimulated cAMP pathway, the MC4R also activates MAPKs, especially ERK1/2. We also showed there is biased signaling in the two signaling pathways, with inverse agonists in the Gs-cAMP pathway acting as agonists for the ERK1/2 pathway. In the current study, we sought to determine whether defects in basal or agonist-induced ERK1/2 activation in MC4R mutants might potentially contribute to obesity pathogenesis in patients carrying these mutations. The constitutive and ligand-stimulated ERK1/2 activation were measured in wild type and 73 naturally occurring MC4R mutations. We showed that nineteen mutants had significantly decreased basal pERK1/2 level, and five Class V variants (where no functional defects have been identified previously), C40R, V50M, T112M, A154D and S295P, had impaired ligand-stimulated ERK1/2 activation. Our studies demonstrated for the first time that decreased basal or ligand-stimulated ERK1/2 signaling might contribute to obesity pathogenesis caused by mutations in the MC4R gene. We also observed biased signaling in 25 naturally occurring mutations in the Gs-cAMP and ERK1/2 pathways. Keywords: Melanocortin-4 receptor, naturally occurring mutation, extracellular signal-regulated kinases 1 and 2 signaling, biased signaling. The melanocortin-4 receptor (MC4R) is a member of Family A G protein-coupled receptors (GPCRs) that has been shown to be involved in regulating energy homeostasis, including both energy intake and expenditure [1-3]. Human genetic studies demonstrated that functionally relevant mutations in the MC4R confer the commonest major gene form of obesity, characterized by its early-onset and severity . About 170 MC4R mutations, including nonsense, missense, frameshift, and inframe deletions, have been identified, primarily from study groups of obese patients of different ethnic origins [5, 6]. We grouped MC4R mutations into five Classes . Class I are null mutations that are defective in receptor biosynthesis. Class II mutants are synthesized but defective in trafficking onto the cell surface. Class III mutants are synthesized and transported onto the cell surface, but are defective in ligand binding. Class IV mutants have normal cell surface expression and ligand binding but are defective in Gs-mediated cAMP signaling. Class V variants have no known defects with normal cell surface expression, ligand binding and cAMP signaling . The obesity observed in vivo in the patients could not be well explained by the in vitro cellular phenotype with Class V variants. Therefore, the analysis of the in vitro signaling defects of these mutations is necessary to understand its potential roles in obesity pathogenesis. When the MC4R was cloned, it was shown to be coupled to the stimulatory G protein, increasing adenylyl cyclase activity and intracellular cAMP levels [8, 9] (reviewed in ). Indeed, almost all of the earlier studies on the MC4R used direct or indirect measures of cAMP levels as the indicator for receptor activation. However, like other GPCRs, the MC4R has been found to activate other G proteins, including the inhibitory G protein (Gi) and signaling pathways, including MAPK, such as ERK1/2, p38 MAPK, and c-Jun NH2-terminal kinase [3, 11, 12]. In vitro experiments in different cell lines expressing MC4R heterologously or GT1-1 cells that express mouse MC4R endogenously showed that agonist stimulation of MC4R activates ERK1/2, which can be mediated by cAMP-protein kinase A, phosphatidylinositol 3-kinase, calcium, and protein kinase C, depending on the cell lines used [13-16]. In vivo, activation of ERK1/2 by MC4R is also observed in the hypothalamus, and this signaling is involved in mediating melanotan II-induced inhibition of food intake [14, 17]. Therefore, defective ERK1/2 signaling might be involved in obesity pathogenesis caused by mutations in the MC4R gene. Previous studies discovered biased activation of ERK1/2 in MC4R with several artificially generated and one naturally occurring MC4R mutations having divergent basal or agonist-stimulated cAMP and ERK1/2 signaling [12, 18-20]. We also showed that several inverse agonists at the Gs-cAMP pathway are indeed agonists at the ERK1/2 pathway, suggesting that these ligands are biased . However, little is known about the potential dysfunction in ERK1/2 signaling in naturally occurring MC4R mutations, and their contributions to obesity pathogenesis in patients carrying these mutations. In the present study, we investigated the constitutive and ligand-stimulated activation of ERK1/2 in wild type (WT) and 73 naturally occurring MC4R mutations from all five Classes (Fig. 1). By comparing the signaling properties of the mutant receptors in the Gs-cAMP pathway previously reported and the ERK1/2 data obtained in the current study, we were interested in whether there is biased signaling in the naturally occurring MC4R mutations. Schematic model of the human MC4R. The naturally occurring mutations characterized in this study are highlighted with gray background. The variants that had impaired ligand-stimulated ERK1/2 activation in Class V are highlighted with red background. The mutations that had biased signaling in the Gs-cAMP and ERK1/2 pathways are highlighted with blue background. Biased signaling, also called functional selectivity, agonist-directed stimulus trafficking, or ligand-induced differential signaling, is a very actively studied area in GPCR field, representing a frontier in GPCR pharmacology and drug discovery [21-26]. Biased ligands with enhanced therapeutic potential and diminished side effects targeting several GPCRs are in various stages of clinical trials. The atomic basis of biased signaling is also beginning to be elucidated with crystal structure analysis [27-30]. Not only ligands can be biased, mutant receptors can also be biased [24, 31]. In addition to lab-generated mutations that show biased signaling (see  for an example), naturally occurring mutations in several GPCRs including glucagon-like peptide-1 receptor, calcium-sensing receptor, melanocortin-1 receptor, and MC4R, have also been shown to exhibit biased signaling [12, 33-36]. With the MC4R, only one mutation, D90N, was shown previously to have biased signaling . Therefore our data on 73 mutations would expand this observation significantly. [Nle4,D-Phe7]-α-MSH (NDP-α-MSH) was purchased from Peptides International (Louisville, KY). Cell culture plates and flasks were purchased from Corning (Corning, NY). Cell culture media, newborn calf serum, antibiotics and reagents were obtained from Invitrogen (Carlsbad, CA). The WT human MC4R in pcDNA3.1 was previously described . Mutant MC4Rs used in this study were generated using QuikChangeTM site-directed mutagenesis kit (Stratagene, La Jolla, CA) and have been reported in our previous studies [7, 37-43]. Plasmids prepared were sequenced by the DNA Sequencing Facility of University of Chicago Cancer Research Center (Chicago, IL, USA) before used for transfection experiments. HEK293T cells were obtained from the American Type Culture Collection (Manassas, VA), and maintained at 5% CO2 in DMEM containing 10 mM HEPES, 10% newborn calf serum, 100 units/ml penicillin, 100 μg/ml streptomycin, 0.25 μg/ml amphotericin B and 50 μg/ml gentamicin. Cells were plated on gelatin-coated 100 mm dishes and transfected at 50-70% confluency using calcium phosphate transfection method. Then cells were washed twice and incubated with Waymouth/BSA (Waymouth's MB752/1 media (Sigma-Aldrich, St. Louis, MO) containing 1 mg/ml bovine serum albumin (BSA)) 24 h after transfection and starved for 18 h at 37 °C before ligand stimulation. The phosphorylated ERK1/2 (pERK1/2) activity was measured as described previously [16, 19, 20]. Briefly, 48 h after transfection, starved cells (see above) were treated for 5 min with either buffer alone or 1 μM NDP-α-MSH. The time point in the experiments was chosen based on previous report of MC4R-mediated ERK1/2 signaling . Cells were solubilized in lysis buffer and lysates were separated on 10% SDS-PAGE gel. Proteins were then transferred onto PVDF membrane. 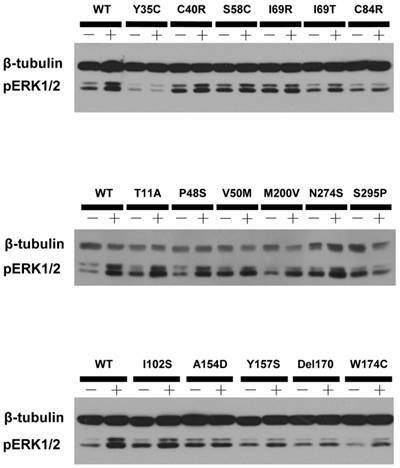 Phospho-ERK1/2 and β-tubulin were detected by immunoblotting with rabbit anti-pERK1/2 antibody (1:1000~1:2000, Cell Signaling Technology, Beverly, MA) and mouse anti-β-tubulin antibody (1:5000~1:10,000, Developmental Studies Hybridoma Bank at the University of Iowa, Iowa City, IA), respectively. Blots were probed with horseradish peroxidase-conjugated secondary donkey anti-rabbit (1:2000) and horseradish peroxidase-conjugated donkey anti-mouse (1:5000~1:10,000, both from Jackson ImmunoResearch Laboratories, West Grove, PA) at room temperature for 2 h. The membranes were then visualized using enhanced chemiluminescence reagent (Pierce, Rockford, IL) and quantified using ImageJ 1.44 software (National Institute of Health, Bethesda, MD) after densitometric scanning of the films. ERK1/2 phosphorylation was normalized according to the loading of proteins by expressing the data as a ratio of pERK1/2 over β-tubulin. The significance of differences in pERK1/2 activities between WT and mutant MC4Rs were analyzed using paired two-tailed Student's t-test with GraphPad Prism 4.0 software (La Jolla, CA). HEK293T cells, which do not express MC4R endogenously , have been widely used as a mammalian expression system in MC4R studies. We used HEK293T cells transiently transfected with the WT or 73 naturally occurring MC4R mutations to study the effect of NDP-α-MSH on MAPK pathway. No significant change of pERK1/2 level was observed upon NDP-α-MSH treatment in HEK293T cells transiently transfected with the empty vector pcDNA3.1 (data not shown). The pERK1/2 levels of the 30 Class V variant MC4Rs, where no functional defects were identified previously, including R7C, T11A, S30F, Y35C, D37V, C40R, P48S, V50M, F51L, T112M, A154D, H158R, I170V, M200V, F201L, F202L, M208V, M218T, G231S, G231V, N240S, G252S, N274S, I289L, S295P, R305S, I317V, L325F, Y332C and Y332H, were measured after 5 min stimulation with NDP-α-MSH. As shown in Figs. 2 and 3, we found that C40R and A154D did not respond to NDP-α-MSH stimulation in ERK1/2 activation. Although the pERK1/2 levels of V50M, T112M, and S295P MC4Rs were increased significantly upon NDP-α-MSH stimulation (P < 0.05), the stimulation was significantly lower than that of the WT MC4R (P < 0.05). The other 25 Class V variants showed similar agonist-stimulated ERK1/2 activation as the WT MC4R (P < 0.05) (Figs. 2 and 3). The pERK1/2 levels of the four mutant MC4Rs in Class IV (mutants that are expressed on the cell surface and can bind the ligand but are defective in Gs-cAMP signaling), including D90N, S136F, A175T and C326R, were examined after 5 min stimulation with NDP-α-MSH in HEK293T cells transiently transfected with these MC4R mutants. As shown in Fig. 4, A175T and C326R MC4Rs had significant ligand-stimulated ERK1/2 activation, similar to that of the WT MC4R (P < 0.05). 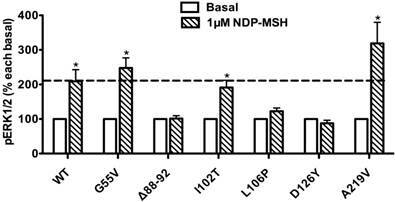 D90N and S136F did not respond to NDP-α-MSH stimulation with ERK1/2 activation. A representative blot of ligand-stimulated ERK1/2 activation in HEK293T cells transiently transfected with Class V variants. The ligand-stimulated pERK1/2 levels in HEK293T cells transiently transfected with Class V variants. Results are expressed as percentage of the value obtained in non-stimulated cells and represent the mean ± SEM of five independent experiments. * indicates significant difference from basal pERK1/2 level or from the stimulation of the WT MC4R (P < 0.05). The ligand-stimulated pERK1/2 levels in HEK293T cells transiently transfected with Class IV mutants. Results are expressed as percentage of the value obtained in non-stimulated cells and represent the mean ± SEM of five independent experiments. * indicates significant differences from basal pERK1/2 level (P < 0.05). The ligand-stimulated pERK1/2 levels in HEK293T cells transiently transfected with Class III mutants. Results are expressed as percentage of the value obtained in non-stimulated cells and represent the mean ± SEM of five independent experiments. * indicates significant differences from basal pERK1/2 level (P < 0.05). The pERK1/2 levels of six Class III mutant MC4Rs (mutants that are expressed on the cell surface but have defects in ligand binding), including G55V, Δ88-92, I102T, L106P, D126Y, and A219V, were measured after 5 min stimulation with NDP-α-MSH in HEK293T cells transiently transfected with these MC4R mutants. As shown in Fig. 5, we found that G55V, I102T and A219V MC4Rs had significantly increased pERK1/2 levels, similar to that of the WT MC4R (P < 0.05). Δ88-92, L106P and D126Y did not respond to NDP-α-MSH stimulation with ERK1/2 activation. 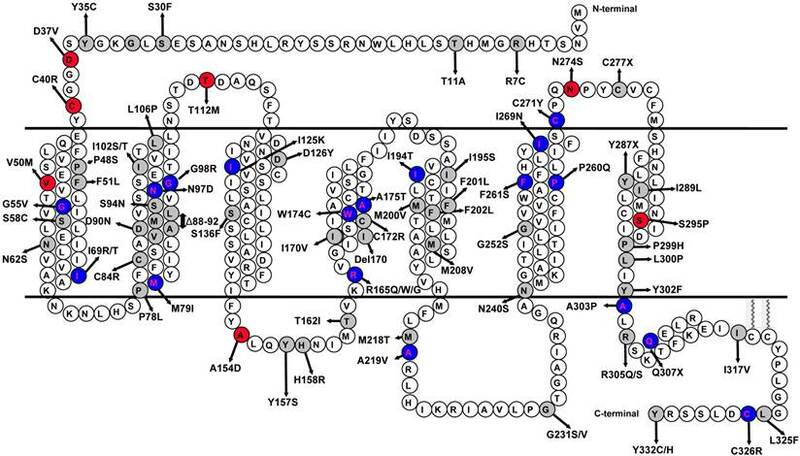 The pERK1/2 levels of 29 Class II mutant MC4Rs (mutants that are translated but are defective in trafficking onto the cell surface), including S58C, N62S, I69R, I69T, P78L, C84R, N97D, G98R, I102S, I125K, Y157S, T162I, R165G, R165W, R165Q, C172R, W174C, I194T, I195S, P260Q, F261S, I269N, C271Y, P299H, L300P, Y302F, A303P, R305Q, and Q307X, were measured after 5 min stimulation with NDP-α-MSH in HEK293T cells transiently transfected with these mutants. As shown in Fig. 6, seven mutants, including I69T, N97D, G98R, I125K, W174C, I194T and F261S, had significantly increased pERK1/2 levels, similar to the WT MC4R (P < 0.05). Eight mutants, including S58C, I195S, P260Q, C271Y, L300P, Y302F, R305Q and Q307X, although responded to NDP-α-MSH stimulation with increased pERK1/2 levels, had lower responses than the WT MC4R. 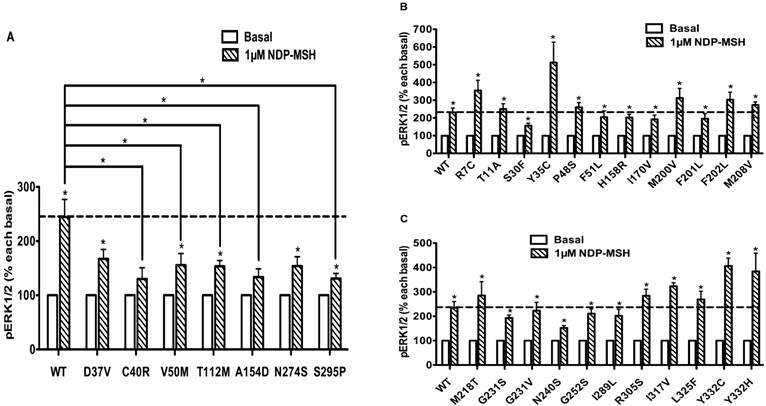 The other fourteen Class II mutants had no response to NDP-α-MSH stimulation in ERK1/2 activation. The pERK1/2 levels of four Class I mutant MC4Rs (mutants that have decreased expression levels), including M79I, S94N, Del170, and C277X, were measured after 5 min stimulation with NDP-α-MSH in HEK293T cells transiently transfected with MC4R mutants. As shown in Fig. 7, we found that M79I and S94N had significantly increased pERK1/2 levels (P < 0.05), whereas Del170 and C277X MC4Rs exhibited impaired ERK1/2 activation. The ligand-stimulated pERK1/2 levels in HEK293T cells transiently transfected with Class II mutants. Results are expressed as percentage of the value obtained in non-stimulated cells and represent the mean ± SEM of five independent experiments. * indicates significant differences from basal pERK1/2 level (P < 0.05). The ligand-stimulated pERK1/2 levels in HEK293T cells transiently transfected with Class I mutants. Results are expressed as percentage of the value obtained in non-stimulated cells and represent the mean ± SEM of five independent experiments. * indicates significant differences from basal pERK1/2 level (P < 0.05). The basal pERK1/2 levels in HEK293T cells transiently transfected with WT or mutant MC4Rs with increased basal pERK1/2 levels (A), or decreased basal pERK1/2 levels (B and C). Results are expressed as percentage of the WT basal pERK1/2 level and represent the mean ± SEM of five independent experiments. * indicates significant differences (P < 0.05). To evaluate the obesity pathogenesis caused by mutations in the MC4R gene through constitutive MAPK signaling, we compared the basal pERK1/2 levels of these 73 mutants with the WT MC4R. 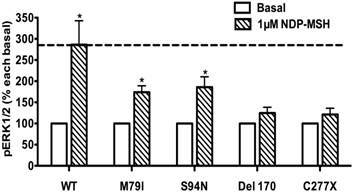 Three mutants, R165G, R165W and C172R, displayed significantly increased basal pERK1/2 signaling (P < 0.05) (Fig. 8A) compared with the basal level of the WT MC4R. The basal pERK1/2 levels of nineteen mutants, including R7C, Y35C, G98R, L106P, D126Y, S136F, H158R, T162I, W174C, M208V, A219V, G231S, G252S, F261S, C277X, L300P, Y302F, R305S and I317V, were significantly decreased compared with that of the WT MC4R (P < 0.05) (Fig. 8B and 8C). The other 51 mutant MC4Rs had similar basal pERK1/2 levels as the WT MC4R (data not shown). In addition to the conventional Gs-stimulated adenylyl cyclase pathway, the MC4R also activates MAPKs, especially ERK1/2. The activation of ERK1/2 pathway is one cellular mechanism that may underlie the regulation of energy homeostasis mediated by the MC4R. In this study, we investigated the constitutive and ligand-stimulated activation (pERK1/2) in WT and 73 naturally occurring MC4R mutations, including mutations from all five classes. Our hypothesis was that decreased basal or ligand-stimulated ERK1/2 signaling might contribute to obesity pathogenesis caused by mutations in the MC4R gene. We were also interested in investigating whether there was biased signaling in these naturally occurring mutations in the Gs-cAMP and ERK1/2 pathway. In previous functional characterization studies, Class V variants behave similarly as the WT MC4R in heterologous expression systems in all parameters studied, including cell surface expression, ligand binding, and agonist-stimulated cAMP [7, 37]. Whether and how these variants cause energy imbalance and therefore obesity was unclear. We hypothesized that defect in ERK1/2 signaling might contribute to obesity pathogenesis. We measured pERK1/2 levels of 30 Class V variants after 5 min stimulation with NDP-α-MSH. The cell surface expression, ligand binding, and cAMP accumulation (both basal and stimulated) of five variants (C40R, V50M, T112M, A154D, S295P) are similar to the WT MC4R [7, 37, 39, 44]. In the present study, we found that these five variants had impaired ligand-stimulated ERK1/2 activation (Figs. 2 and 3). We propose that defective ERK1/2 signaling in these Class V variants might be a cause of obesity observed in patients harboring these variants. Class IV mutants are expressed on the cell surface and bind ligand with normal affinity, but are defective in agonist-stimulated signaling (decreased efficacy and/or potency) at the Gs-cAMP pathway, including D90N, S136F, A175T and C326R. The expression of A175T on the plasma membrane is similar to that of the WT receptor, but its ability to generate cAMP in response to ligand is reduced [44, 45]. C326R also has impaired cAMP signaling . Our results indicated that A175T and C326R MC4Rs, although defective in Gs-cAMP signaling, retained normal ERK1/2 signaling in response to NDP-α-MSH stimulation as the WT MC4R, hence exhibiting biased signaling in the Gs-cAMP and ERK1/2 pathways (Fig. 4). In contrast, D90N and S136F MC4Rs, with defective Gs-cAMP signaling, also had decreased ERK1/2 activation, exhibiting no biased signaling (Fig. 4). Interestingly, of all the naturally occurring mutations in the MC4R reported, D90N and S136F are the only mutations that exert dominant negative effect on the WT MC4R [47, 48], very different from the studies in other GPCRs where intracellularly retained GPCRs frequently exert dominant negative effect on the cognate WT receptors when co-expressed [49, 50]. We cannot discern a causal relationship between the lack of biased signaling and dominant negative effect in these two mutations. Class III mutant MC4Rs are expressed on the cell surface, but are defective in ligand binding per se, with either decreased binding capacity and/or affinity, resulting in impairments in hormone stimulated signaling, including G55V, Δ88-92, I102T, L106P, D126Y and A219V. We found that G55V and A219V had increased pERK1/2 levels upon NDP-α-MSH stimulation, although they have significant decrease in binding capacity [40, 43] (Fig. 5), likely due to the presence of spare receptors . Δ88-92, L106P and D126Y MC4Rs, with defective ligand binding, also had decreased ERK1/2 activation (Fig. 5). Class II mutant receptors are produced but are retained intracellularly, most likely in the endoplasmic reticulum due to misfolding being detected by the cell's quality control system . This class comprises the largest set of MC4R mutations reported to date. In this study, we investigated the ERK1/2 signaling of 29 Class II mutants. Our results indicated that seven mutants, I69T, N97D, G98R, I125K, W174C, I194T and F261S, showed increased pERK1/2 levels upon NDP-α-MSH stimulation (Fig. 6). I69T MC4R has only 34% of the cell surface expression and 5% of cAMP signaling of the WT MC4R . N97D and I125K have defective cell surface expression and are unable to generate cAMP in response to ligand stimulation [44, 52], but its MAPK signaling could be stimulated by NDP-α-MSH. G98R has negligible cell surface expression . W174C and F261S have significantly reduced cell surface expression levels compared to the WT MC4R . 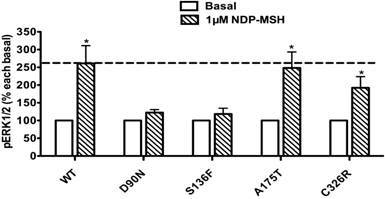 I194T has decreased cell surface expression, with no measurable ligand binding or signaling to either α-MSH or β-MSH stimulation . However, these mutant MC4Rs could respond to NDP-α-MSH stimulation with increased ERK1/2 signaling, suggesting that these Class II mutants with partial defect in cell surface expression exhibited biased signaling. In the follicle-stimulating hormone receptor, a naturally occurring mutation results in diminished expression at the cell surface and lack of detectable Gs-cAMP signaling but retains ERK1/2 signaling . In addition, we found that the other 22 Class II mutants had decreased pERK1/2 levels, consistent with the impaired cell surface expression levels in these mutants (Fig. 6). Due to defective protein synthesis and/or accelerated protein degradation, decreased receptor proteins of Class I mutants are present in the cell. Mutants such as M79I, S94N, Del170, C277X and R305Q likely belong to this class. Although M79I and S94N have relatively normal cell surface expression and ligand binding, they have significantly decreased total expression and partially defective signaling . 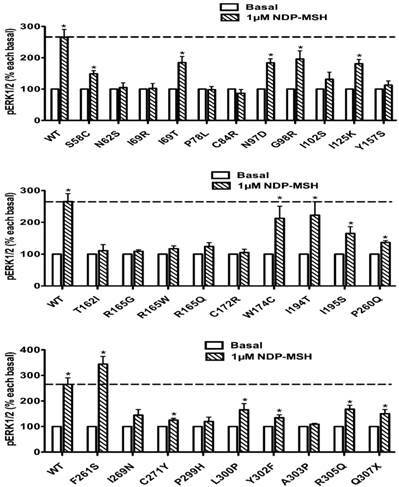 In the present study, the pERK1/2 levels of M79I and S94N MC4Rs were significantly increased upon NDP-α-MSH stimulation, suggesting that these mutants with partial defect in protein expression could stimulate ERK1/2 signaling (Fig. 7). Table 1 summarizes the cAMP signaling data previously reported in the literature (together with the original references) and ERK1/2 signaling data reported in this paper. By comparing the two sets of data, we can tentatively identify the biased mutant receptors. The WT MC4R has some basal activity in cAMP production . Previously, it was suggested that defects in basal cAMP signaling contribute to obesity pathogenesis caused by mutations in the MC4R gene . We asked whether defects in basal MAPK signaling might also cause obesity. We compared the basal pERK1/2 levels of the 73 mutants with the WT MC4R. Nineteen mutants, including R7C, Y35C, G98R, L106P, D126Y, S136F, H158R, T162I, W174C, M208V, A219V, G231S, G252S, F261S, C277X, L300P, Y302F, R305S and I317V, had significantly decreased basal pERK1/2 levels compared with that of the WT MC4R (Fig. 8B,C). We suggest that decreased basal ERK1/2 signaling might contribute to obesity pathogenesis caused by mutations in the MC4R gene, especially for mutants with no defects identified so far, such as Y35C, H158R, G231S, R305S, and I317V. In addition, we found that three mutants, R165G, R165W and C172R, had significantly increased basal pERK1/2 signaling compared with that of the WT MC4R (Fig. 8A). We have observed constitutive activation of ERK1/2 signaling pathway in the MC4R before in both naturally occurring and laboratory-generated mutations [10, 16, 20]. 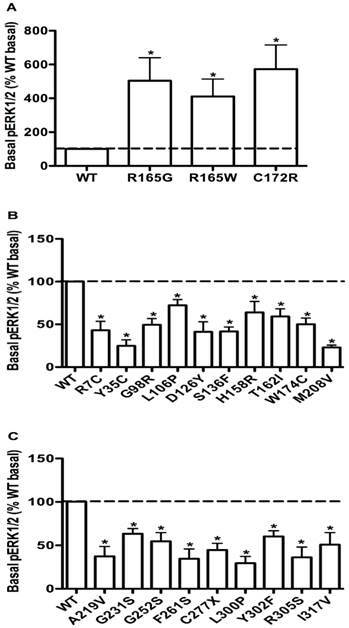 Because the basal activities in the Gs-cAMP pathway for the three mutations, R165G, R165W and C172R, are not increased compared to the WT MC4R [43, 56], but they were constitutively active in the ERK1/2 signaling pathway, therefore they had biased constitutive activity. Previously, in the melanocortin-1 receptor, a mutant receptor constitutively active in the Gs-cAMP pathway is not constitutively active in the ERK1/2 pathway, also representing a case of biased constitutive signaling . Ligand-induced cAMP and ERK1/2 signaling in mutant MC4Rs. “↑”: denotes normal ligand-stimulated response as WT MC4R. “↓”: denotes defective ligand-stimulated response compared to WT MC4R. “Bias” column is designed to demonstrate whether ligand-stimulated cAMP and pERK1/2 signaling pathways were divergent. “Yes” denotes biased activation of either signaling pathway; “No” denotes balanced cAMP and pERK1/2 signaling. Although this is the first comprehensive study on biased signaling in naturally occurring mutations in the MC4R, these findings need to be further confirmed in neuronal cells since the MC4R is expressed primarily in the central nervous system in vivo. Our recent studies on the pharmacoperones for the MC4R compared the rescuing efficacy in HEK293 cells and neuronal cells [58, 59]. Our results showed that although the results are very similar, a few differences indeed are observed. More importantly, future studies need to confirm the in vivo relevance of mutant receptors with biased signaling properties in regulating energy homeostasis using knockin mice. For the MC4R, proximal (conformational changes in the receptor upon binding of biased ligand or receptor mutation), intermediate (from conformational change into downstream signaling), and distal (effects of differential signaling on the gene expression and physiology) mechanisms of biased signaling  all remain to be further explored. In conclusion, the results of the present study demonstrated that nineteen mutants had significantly decreased basal pERK1/2 level, and five Class V variants had impaired ligand-stimulated ERK1/2 activation. The decreased basal or ligand-stimulated ERK1/2 signaling might contribute to obesity pathogenesis caused by mutations in the MC4R gene. We also observed biased signaling in these naturally occurring mutations in the Gs-cAMP and ERK1/2 pathway. ERK1/2: extracellular signal-regulated kinases 1 and 2; GPCR: G protein-coupled receptor; MAPK: mitogen-activated protein kinas; MC4R: melanocortin-4 receptor; NDP-α-MSH: [Nle4,D-Phe7]-α-melanocyte stimulating hormone; pERK1/2: phosphorylated ERK1/2; WT: wild type. We thank M. Klymkowsky for providing the E7 beta-tubulin antibody, which was obtained from the Developmental Studies Hybridoma Bank developed under the auspices of the NICHD and maintained by The University of Iowa, Department of Biology, Iowa City, IA 52242. This study was funded by the American Diabetes Association Grant 1-12-BS212, and Auburn University Intramural Grant Program and Interdisciplinary Grant of College of Veterinary Medicine at Auburn University. Corresponding author: Ya-Xiong Tao, PhD. Department of Anatomy, Physiology and Pharmacology, 212 Greene Hall, College of Veterinary Medicine, Auburn University, Auburn, AL 36849, United States. Tel: 01-334-844-5396; FAX: 01-334-844-5388 Email: taoyaxiedu.